For decades, the agriculture industry has focused, studied and ultimately understood the physical and chemical characteristics of our soil resource (e.g., soil texture, soil pH, etc.). However, until the past few years, little emphasis has been placed on the biological constituents and their importance in a healthy, functional soil. Soil is not simply a medium to grow plants. It is a living ecosystem, and it puts on a show if you know where and what to look for. A living soil is a complex and dynamic environment with as much drama and suspense as a Hollywood movie. A living soil features predator-prey conflicts, high-speed action and even mutual partnerships. The trouble is seeing the picture. These activities are happening everyday on the soils we stand on, only at the microscopic scale. We often hear of the cast of characters: bacteria, fungi, protozoa, arthropods, even earthworms. So what’s the storyline? What do they do and why does it matter? 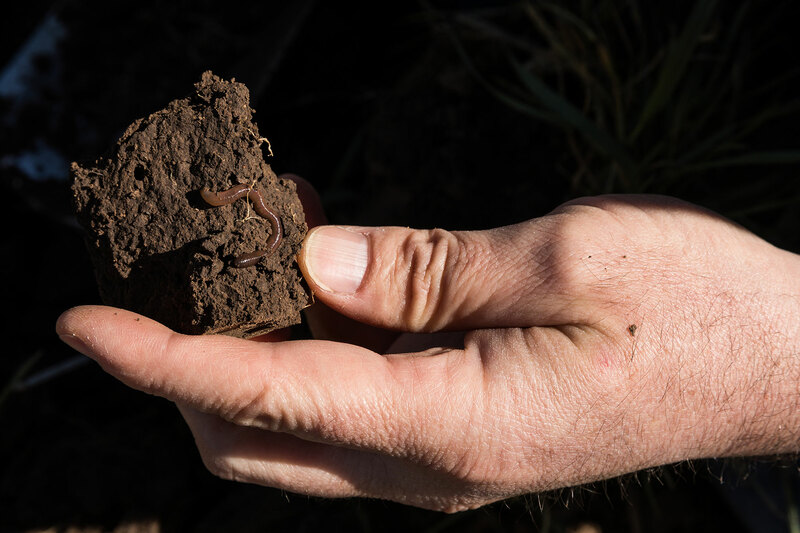 The presence of earthworms is an indicator of soil health. Earthworms help improve water dynamics in the soil by burrowing through the earth, creating tunnels for water and roots to travel. 1. Decomposition of Organic Matter and Material. Soil organic matter stores energy and nutrients that are used by both plants and soil microbes. Organic matter is a primary food source for soil microbes and is a product of biological decomposition. One class of bacteria and fungi are decomposers, meaning they have the ability to break down organic material releasing useful nutrients. While bacteria generally utilize carbon sources that are easy to break down (like fresh plant material and plant exudates, which are sugars and other metabolites leaked from the roots), decomposing soil fungi generally can break down tougher sources like cellulose and lignin. Organic matter is a primary driver of soil productivity and is the foundation of functional soil biology. As goes soil organic matter, so goes the soil. Soil biology is a primary driver of nutrient cycling in our soils. Soil bacteria utilize active carbon, the fraction directly available for use by microbes. Much of this active carbon begins as plant exudates. These exudates excreted from plant roots are a primary food source and are utilized by soil bacteria directly along the plant roots. As the bacteria die, they mineralize and release nitrogen contained in their bodies, thus cycling nutrients. As the bacteria die, they mineralize and release nitrogen contained in their bodies, thus cycling nutrients. The microbes themselves constitute a considerable amount of nutrient cycling in their own biomass. The microbial biomass or the amount of microbes a soil sustains can be 2 to 5 percent of the total organic matter in a soil. However, this fraction is self-motivated and living. This fraction also contains considerable amounts of essential plant nutrients. Biologically significant amounts of nitrogen, sulphur and phosphorus are mineralized into plant available forms and released for uptake when microbes expire. Protozoa also play a key role in nutrient cycling by just doing what they do. Protozoa are predators. They feed on soil bacteria. Soil bacteria have a carbon-to-nitrogen ratio of about 5:1 while protozoa have a ratio closer to 10:1. As the protozoa feed on the bacteria, they consume more nitrogen than they need. The excess is excreted and utilized by plants, and the cycling process continues. Soil aggregation refers to a soil’s ability to hold particles together. Soil biology aids in this process by simply decomposing organic material and developing organic matter. As organic matter increases in soil, the ability to form soil aggregates increases. Soil fungi aid in this process by helping the soil physically hold particles together. Arbuscular mycorrhizal fungi coat their hyphae with a compound called glomalin. Glomalin serves as a protective coating to prevent nutrient and water loss as they are transported to the plant. Glomalin also serves as a soil glue and helps stabilize soil aggregates. These processes, along with many others, improve soil structure and helps soil resist disruptions like wind and water. Nutrient availability is also positively impacted by microbial activity. Soil fungi plays a large role. Soil fungi form long strands called hyphae. These hyphae extend through the soil between soil aggregates, particles and rocks. Mycorrhizal fungi form mutualistic relationships with plants. Mycorrhizal fungi utilize carbon from plant roots. In exchange, the fungi helps solubilize phosphorus and other nutrients, making them available for plant use. This process essentially extends the reach of plant roots, increasing their ability to tap nutrients. Some soil bacteria form symbiotic relationships with plants to increase nutrient availability. Rhizobium bacteria infect the root hairs of specific legume species. In exchange for carbon, this bacteria fixes atmospheric nitrogen. This nitrogen is available for the plant itself to use. However, once the plant dies, the excess nitrogen is released and available for subsequent plant use. Through the processes outlined above, soil biology ultimately aids in soil water dynamics such as infiltration and water holding capacity. As organic matter increases, soil aggregation follows. As soils aggregate their particles, the pore space and porosity increases. Earthworms also aid in this process by burrowing through the soil, creating tunnels for water and roots to travel. As pore space increases, the amount of water that can effectively infiltrate into the soil profile generally increases. The goal is to get the water in the ground and to minimize run off. Soil biology aids in that process. A soil’s available water holding capacity is also aided by soil biology. Organic matter is very efficient at holding water. As biologically active soils increase organic matter, their capacity to hold water can increase. This process tends to be more effective on coarser soils. Clay substrate soils may have a lesser impact as the clay itself is the driver for its capacity to hold water.